Wright (Co) Model EX "Vin Fiz"
The Wright (Co) Model EX "Vin Fiz" on display in the Pioneers of Flight gallery at the National Mall building. 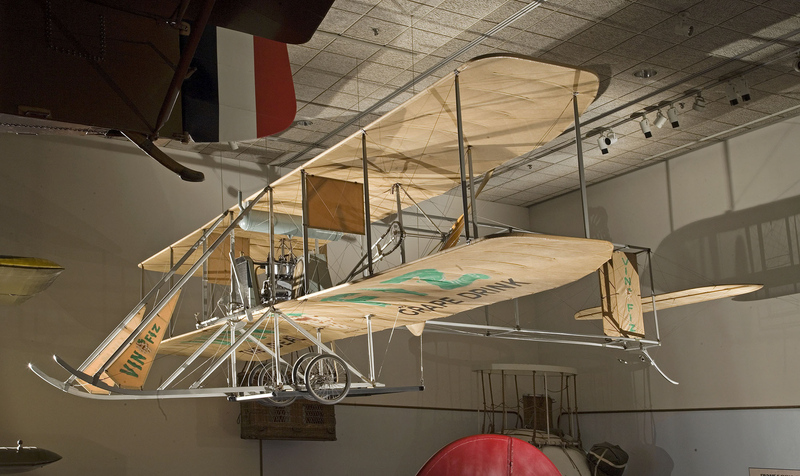 Cal Rodgers completed the first transcontinental flight across the U.S. in the Wright EX "Vin Fiz" on Nov. 5, 1911. According to the Hearst prize, Rodgers only needed to fly to Pasadena, CA, but wanting to fly coast to coast, he continued on to Long Beach on December 10 and had the plane rolled into the surf to get this photograph in the Pacific Ocean. Cal Rodgers Flying the Wright EX "Vin Fiz"
The first crossing of the United States by airplane was achieved by Calbraith Perry Rodgers in 1911. Rodgers' Wright EX biplane was named the Vin Fiz after his sponsor's grape soda product. Calbraith Perry Rodgers and the Wright EX "Vin Fiz"
Cal Rodgers is shown standing by his Wright EX "Vin Fiz" in which he completed the first crossing of the United States by airplane. After the Wright brothers perfected their original design in 1905, and publicly demonstrated it in 1908 and 1909, they began manufacturing airplanes for sale in 1910. Their first offering was the Wright Model B. The Wright EX (Vin Fiz shown here) was a slightly smaller, single-seat version for exhibition flying. The first crossing of the United States by airplane was achieved by Calbraith Perry Rodgers in 1911. In 1910, famed publishing magnate William Randolph Hearst announced his offer of a $50,000-prize for a U.S. transcontinental flight in thirty days or less. Rodgers' Wright EX biplane was named the Vin Fiz after his sponsor's grape soda product. He left Sheepshead Bay, New York, on September 17, 1911. A "hangar" car, a rolling workshop filled with spare parts to repair and maintain the airplane, followed along. The flight was punctuated by numerous stops, delays, and accidents. When Hearst's 30-day time limit expired, Rodgers had only reached Kansas City, Missouri. Undaunted, he continued on, determined to make the first transcontinental airplane flight whether he received the money or not. He arrived in Pasadena, California, to a hero's welcome, 49 days after setting out. Although Pasadena was the official end of the coast-to-coast journey, Rodgers flew on to Long Beach to complete the flight at the shore of the Pacific Ocean. The total distance covered was 6,914 km (4,321 mi) in 82 hours, 4 minutes, total flying time at an average speed of 82.4 kph (51.5 mph). The first crossing of the United States by airplane was achieved by Calbraith Perry Rodgers in 1911 in his Wright EX biplane, named the Vin Fiz. Rodgers had a rich personal heritage of exploration and adventure. He was a descendant of Commodore Mathew Calbraith Perry, famous for opening Japan to U.S. trade in 1853, his brother Oliver Hazard Perry, and Commodore John Rodgers, all of whom had historic naval careers. Rodgers's interest in attending the U.S. Naval Academy was thwarted by his deafness, a condition resulting from a serious bout with scarlet fever as a young boy. Given his nautical lineage, he was an avid sailor and was elected to the prestigious New York Yacht Club in 1902. Rodgers had a love of speed, which he pursued through the recently introduced technologies of motorcycles and automobiles. Rodgers, typically called Cal, was introduced to aviation in June 1911. His cousin, John, a Naval Academy graduate, had been selected to learn to fly the Navy's newly purchased Wright airplane, and was sent to the Wright factory and flying school in Dayton, Ohio, in March 1911. On a visit to his cousin during his training, Cal was immediately hooked on flying, and soon began flight instruction. Shortly thereafter, with his cousin, he ordered a new Wright Model B airplane. A quick study, Rodgers was already flying public exhibitions in Ohio and Indiana with his new aircraft in July. On August 7, 1911, he passed his flight tests for pilot's license number 49, issued by the Aero Club of America. On August 10, he arrived in Chicago to compete in the Chicago International Aviation Meet at Grant Park. He won the duration contest, and along with his performance in other events, earned total prize money of $11,285, and instant celebrity. Ten months earlier, famed publishing magnate William Randolph Hearst, had captured the attention of the aviation world when he announced a $50,000-prize for the first flight across the United States in thirty days or less. The offer was good for one year beginning on October 10, 1910. The bold challenge interested many of the leading names in aviation, including the Wright brothers and Glenn Curtiss. But the technical and logistical demands of such a flight precluded any immediate attempts. In September 1911, three competitors were finally in the race. Cal Rodgers was one of them, along with Robert Fowler and James Ward. Fowler took off from San Francisco on September 11, but after three failed attempts to cross the Sierras, aborted his transcontinental flight by the end of the month. Ward took off from the east coast on September 13, but withdrew little more than a week later, not even making it out of New York State. Following the Grant Park competition in August, Rodgers decided to attempt the coast-to-coast flight. While still in Chicago, he secured financial backing from the Armour Company, a local firm which was then introducing a new grape-flavored soft drink called Vin Fiz. Armour provided a special train, emblazoned with the Vin Fiz logo, with cars for the accommodation of Rodgers's family and his support crew, and a "hangar" car, which was a rolling workshop, filled with spare parts to repair and maintain the airplane over the course of the flight. There was even an automobile on board to pick up Rodgers after forced landings away from the rail line. The pilot would receive five dollars for every mile he flew east of the Mississippi River and four dollars for every mile west of the river. Rodgers agreed to pay for the fuel, oil, spare parts, his mechanics, and the airplane itself, which the Wright Company agreed to build. Chief mechanic on the flight was Charles Taylor, who had worked for the Wright brothers since 1901 and had built the engine for the Wright Flyer, the world's first airplane that flew at Kitty Hawk in 1903. The airplane was a Wright EX, a special design that was used for exhibition flying, which was a slightly smaller version of the Wright Company's standard Model B flyer. Like the support rail car, Rodgers's aircraft carried the Vin Fiz logo on its wings and tail, and was quickly dubbed the Wright EX Vin Fiz. It was powered by a 35-horsepower, Wright vertical four-cylinder engine, and it carried enough fuel for a maximum of 3½ hours flying time. Rodgers began his epic journey from Sheepshead Bay, New York, on September 17, 1911. The flight was punctuated by numerous stops, delays, and accidents. When the 30-day time limit Hearst imposed for the $50,000 prize had expired, he had only reached Kansas City, Missouri. Undaunted, Rodgers continued on, determined to make the first transcontinental airplane flight whether he received the money or not. Upon leaving Kansas City, he flew due south to Texas, and then made his way across the southern U.S. border toward Pasadena, California, the official termination point of the flight. Rodgers continued to experience frequent mechanical failures, damage to the airplane in hard landings, and weather delays. Trouble arose again on November 3, shortly after passing over Imperial Junction, California, less than 320 km (200 mi) from the finish. At 1,200 m (4,000 ft), an engine cylinder exploded, damaging one of the wings and driving steel shards into Rodgers's right arm. He struggled to regain control of the Vin Fiz and, amazingly, managed to glide the 10 km (6 mi) back to Imperial Junction and land safely. The engine and airplane were repaired a day later, and despite his painful injury, Rodgers departed for Pasadena once again on November 4. Further engine problems forced him down in Banning, California, about half way to his final destination. On November 5 he was airborne again, and after brief stops in Beaumont and Pomona, he arrived in Pasadena to a hero's welcome, 49 days after setting out from Sheepshead Bay. Rodgers and his wife liked Pasadena and decided to stay. He kept the Vin Fiz and a second airplane, a two-seat Wright Model B, at nearby Dominguez Field. He made exhibition flights with the Vin Fiz and took up passengers and gave flight instruction with the Model B. He later moved the airplanes to Long Beach and operated from there. On April 3, 1912, Rodgers was airborne in the Model B, making a test flight after some tuning of the engine in preparation for another passenger ride. Witnesses observed a steep dive as Rodgers apparently attempted to avoid a flock of seagulls. In the next instant he was seen struggling with the controls just before the airplane crashed into the surf, only one hundred yards from his landing spot after the last leg of the transcontinental flight in December. Rodgers was killed instantly. Various causes for the accident were put forth, ranging from a seagull jamming the controls to Rodgers's recklessness or carelessness as a pilot. The precise cause remains undetermined. The wreckage of Rodgers's Model B was acquired by one of his mechanics, Frank Shaffer, and his partner Jesse Brabazon. They rebuilt it and flew for approximately one year until it was destroyed in a crash while being piloted by Brabazon's friend, Andrew Drew, who was killed. The Vin Fiz was acquired after Cal's death by his cousin, Lt. John Rodgers, USN. He offered it to the Smithsonian Institution, but it was not accepted on the grounds that it was very similar to the recently acquired Wright Military Flyer. It then passed to Rodgers's wife, Mabel, who, not long after Cal's death, married Charles Wiggin. They exhibited and flew the Vin Fiz publicly for two years, until Rodgers's mother was awarded possession of the airplane in 1914 in a court ruling regarding Cal's estate. The history of the airplane becomes somewhat murky at this point. According to Charles Taylor, the Wright mechanic who assisted Rodgers on the transcontinental flight, Rodgers's mother shipped the Vin Fiz to the Wright factory in Dayton, Ohio, for refurbishment. Either unable or unwilling to pay for the work, she allowed the airplane to languish at the Wright factory and it was destroyed in 1916 after the company was sold. But this version of events is at odds with the fact that Rodgers's mother had the Vin Fiz restored and donated it to the Carnegie Institute in Pittsburgh in 1917. The airplane was later acquired by the Smithsonian from Carnegie in 1934. The probable explanation for the conflicting information lies in the misconception that there was a single Vin Fiz airframe. On the transcontinental flight, several sets of wings and a large supply of other components and spare parts were brought along on the support train. Rodgers's airplane was repaired and rebuilt many times during the trip. By the time the wheels of the Vin Fiz were rolled into the Pacific at Long Beach, almost nothing of the airplane that took off from Sheepshead Bay remained. As a result, at the end of the journey, there were enough flown, genuine Vin Fiz parts to make up more than one airplane. Charles Taylor was probably accurate when he stated that the Vin Fiz sent to the Wright factory (i.e., the intact airplane that Mabel and Charles Wiggin flew in 1912-14) was destroyed. The airplane that ended up at the Carnegie Institute, and then the Smithsonian, was very likely reconstructed from the parts left over from the many repairs and rebuilds during the flight. Thus, the airplane in the NASM collection is genuine in that it is comprised of components that, at various points, were part of the Vin Fiz during the historic coast-to-coast flight. When on display at the Carnegie Institute, the engine mounted on the Vin Fiz was a wooden mock-up. The whereabouts of the original engine are unknown. At the Smithsonian, an original Wright engine of the correct type, but not associated with the flight nor with Rodgers, was put on the airplane. In 1960, the Smithsonian fully restored the Vin Fiz. In 1996, when it was part of a traveling Smithsonian exhibition, a new wooden mock-up engine was made and placed on the airplane. This was done to reduce potential wear and tear on the artifact caused by repeated removal of the heavy, original engine during assembly and disassembly of the airplane on the many stops of the exhibition tour. The mock-up engine remains on the Vin Fiz. Wood and fabric biplane. Single 35-horsepower Wright vertical four-cylinder engine driving two pusher propellers via sprocket-and-chain transmission. Smaller, experimental version of the standard 1910-12 Wright Model B airplane. Charles Taylor was the aircraft mechanic for both the 1903 Wright Flyer and the Wright EX Vin Fiz.